Reformed/Covenant Theology (and other groups have variations) teaches (with some variation in details) that the Church is made up of the elect of all ages, and therefore the Assembly must have begun with the first person who was saved. This is the common view, although some begin the church with the nation Israel. In either case, Reformed men are unanimous in teaching that the Church was present in the Old Testament period. This is illustrated by the headings found at the top of The Thompson Chain Reference Bible in the book of Isaiah: "God's mercy to the Church" "God avengeth His church" "His great mercies to the Church" "The church comforted" "The restoration of the Church" "The church exhorted" "God will comfort His church" "The prophet's zeal for the church" "Confession and complaint of the church" etc. Reformed/Covenant men stress that throughout all history there is but one people of God, and that these saved people comprise the Church. Hebrew Roots and other strains of Messianic Judaism make a similar mistake, saying the Assembly has ever been the same thing as "Israel" and didn't have a distinct beginning after the cross. Dispensationalists or Consistent Literalists teach that the Church is a unique body of believers that began on the day of Pentecost and will be removed from earth on the day that Christ comes for His own (the rapture). It is made up of both Jews and Gentiles united together into one body and enjoying equal status in the body of Christ (Eph. 3:5-6). This is the “one new man” of Ephesians 2:15 and the “one fold” of John 10:16. Others hold to differing positions as to when the Church began. Some Baptist groups believe that the Church began with John the Baptist or at some time during the Lord’s earthly ministry. Others whom we consider ultradispensational, begin the Church years after Pentecost (some in Acts 13 and others in Acts 28). The answer to the question of when the Church began is important and has many theological ramifications. It is not a difficult question to answer. The Scriptures pinpoint the beginning of the Church in a very simple and clear way, as we shall now seek to demonstrate. The key passage on Spirit baptism is found in 1 Corinthians 12:13—“For by one Spirit have all been baptized into one body, whether we be Jews or Gentiles, whether we be bond or free; and have been all made to drink into one Spirit.” The “one body” spoken of in this verse refers to the Church (see 1 Cor. 12:27-28; Eph. 1:22-23; 5:30-32; Col. 1:18), and Christ is the Head of this body. Spirit baptism is defined in 1 Corinthians 12:13 as that work of God whereby believers are baptized (immersed, placed) into Christ’s body, the Church. How then does a believer become a member of the body of Christ? It is by Spirit baptism. The key to when the Church began is this: If we can determine when Spirit baptism first began, then we will know when the church began. When did God first baptize believers into His body? When were believers first placed into the body of Christ? To answer this is to determine the day on which the church began. “I indeed baptize you with water unto repentance: but he that cometh after me is mightier than I, whose shoes I am not worthy to bear: He shall baptize you with the Holy Ghost (Spirit), and with fire” (Matt. 3:11). John’s baptism was a water baptism (“I baptize you with water”); Christ’s baptism would be a spiritual baptism (“He shall baptize you with the Holy Spirit”). The “fire baptism” is for the unsaved and this is yet future (see Matthew 3:12). Notice the phrase, “He shall baptize you with (Greek-en) the Holy Spirit.” The verb “shall baptize” is in the future tense, indicating that Spirit baptism had not yet taken place when John the Baptist spoke these words. John was predicting that it would happen in the future, but he did not predict exactly when it would happen. Notice also that Christ is the Baptizer. He is the One who would place believers into the body of Christ. He is the One who would build His church. Christ is also the Baptizer in 1 Corinthians 12:13, as will be shown later. In Matthew 16:18 the Lord Jesus said, “I will build My Church.” The future tense of the verb indicates that the building of the Church had not yet begun when Jesus said these words. He did not say, “I have built My Church.” He did not say, “I am building My Church.” No, the building project had not yet begun and thus the Church was yet future. At the time Jesus spoke the words of Matthew 16:18 the Church had not yet begun. Today Christ is building His church. He is adding to the church daily such as should be saved (Acts 2:47). But the question is, when did this building program first begin? “For John truly baptized with water; but ye shall be baptized with the Holy Ghost not many days hence” (Acts 1:5). According to our Lord’s prediction, Spirit baptism had not yet taken place yet, though it would soon take place. No one had yet been immersed into the body of Christ. 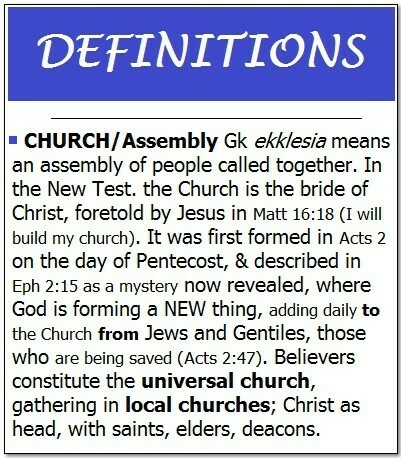 Thus, the Church could not have begun prior to Acts 1:5. When Jesus spoke the words of Acts 1:5 His death and His resurrection had already taken place, and yet Spirit baptism had not yet taken place and the church had not yet been formed. But the announcement of Acts 1:5 was very significant because Jesus said that Spirit baptism would take place “not many days hence” (not many days from now). This means that it would happen soon, in a matter of days. Indeed, as we shall learn, it happened just ten days later on the day of Pentecost. The Day of Pentecost and the unique events that took place on that day are described in Acts chapter 2. In this chapter Spirit baptism is not specifically mentioned. It is not until Acts chapter 11 that we are specifically told that Spirit baptism took place on the day of Pentecost: “And as I began to speak, the Holy Ghost fell on them, as on us at the beginning [on the Day of Pentecost]. Then remembered I the word of the Lord, how that He said, John indeed baptized with water; but ye shall be baptized with the Holy Ghost” (Acts 11:15-16). Based on the clear statement of this passage we know that Spirit baptism first took place on the Day of Pentecost. It was then that believers were first placed into the body of Christ. It was then that the Church began.